Could average speed cameras be put on notorious north-east road? Average speed cameras could be installed on a notorious north-east road as part of multi-million pound plans to improve safety. Nine people have been killed and more than 40 seriously injured on the A947 Aberdeen to Banff route in the last five years. With the rate of fatal or serious collisions 60% higher than the national average, council chiefs ordered a study looking at ways to better the route – with dualling sections and building bypasses among the suggestions put forward. But now further investigations are to be made into the idea of installing controversial average speed cameras along the length of the road, which eventually leads to the Moray Firth coastline. The proposal was put forward during the first wave way of discussions about the study. Aberdeenshire Council’s Formartine area committee is the first to discuss the report, which will go around the other councillors before a final decision on which option – or options – to progress is made by infrastructure services committee. Councillor Paul Johnston called for independent research into installing the cameras along busy stretches of the carriageway. Mr Johnston added that a study would show if the cameras stop the worst drivers who cause “tragic accidents”. The council’s transportation strategy officer Mark Skilling made a commitment to investigate the possibility, but warned the biggest challenge his team faced was building a case for cameras because although the rate of fatal collisions is alarming, the average number of incidents overall is lower than average. His team will now investigate the impact that the cameras have had on both the A9 and south of the border. 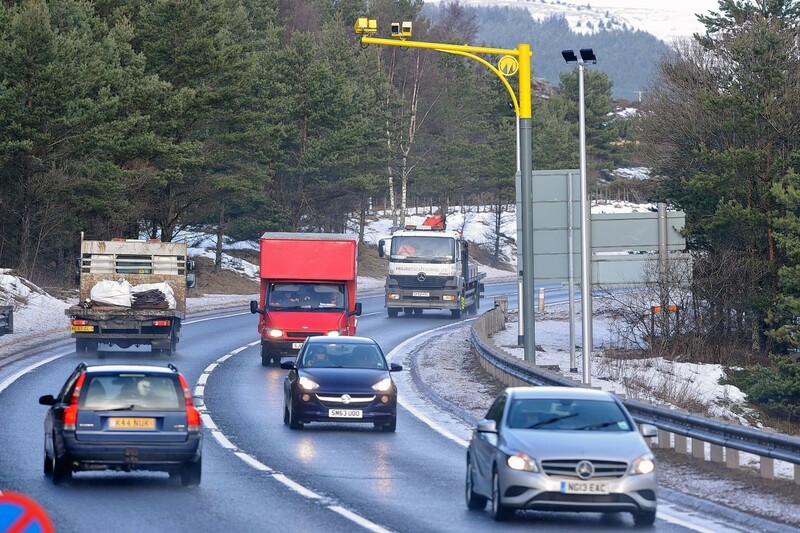 The devices – which opponents refer to as “yellow vultures” – were installed on the A9 in November 2014, and figures released last month by Transport Scotland indicated they had failed to lower the number of deadly accidents between Inverness and Perth. However, the Scottish Government insist there were less fatalities and serious accidents when considering the route in full, from Dunblane – with Transport Secretary Derek Mackay not ruling out the possibility of adding more cameras. Last night Mike Burns, of campaign group A9 Average Speed Cameras Are Not the Answer, said he was dubious that adding the devices to the A947 would be the solution. “I think if you look at other roads compared to the A9, speed cameras do not substitute for good road design and any decision to install cameras is basically an admission of infrastructure failure,” he said. “I nickname them the flags of failure because a decision to put them up shows that they are not willing to get to the root of the problem – improving the road design. He added: “What the A9 proved was that when you have good road design, cameras are irrelevant. If they built a dual carriageway it would probably solve the problems in one go. Among the other ideas tabled include dualling the road between Dyce and Newmachar for £38million, between Dyce and Oldmeldrum for £154million – or even dualling the entire route for a bill of £514million. The report, which was drawn up by Aecom, also proposes building bypass roads around the towns of Turriff, Newmachar and Oldmeldrum to keep lorries and speeding traffic away from busy pedestrian areas. Mr Skilling said although the costs are “eye-watering”, that the proposals are a starting point for the discussion. “We’re setting out our stall,” he added.